20 JulNanny Pat goes extreme! Nanny Pat took Megs from Bissoe to Portreath on the Coast to Coast Trail using a new trailer called a Wee-ho (in 30 degree heat!) which she hired from Bike Chain Bissoe Bike Hire. Wee-ho trailers attach to the back of an adult-sized bike. They’re comfortable and secure, which makes them a good option for keen cyclists with younger kids who can’t go as far under their own steam. The route is approximately 11 miles one way (or 22 miles there and back). It’s a flat, mostly off-road route, which makes it ideal for families and less experienced cyclists. The trail is one of a number of cycle routes that have been made from the old tram roads that were used for transporting ore from the mines Mineral Tramways Cycle Network. There are over 37 miles of trails in all (take a look at the trail map to find out more). Old mine workings, including the distinctive engine houses, are dotted across the landscape. As with most trips, it’s all about being prepared – in her rucksack Nanny Pat had towels, cossies and a bucket and spade! Their latest adventure was a proper day out: two hours to cycle to Portreath, two hours on the beach and one and a half hours to cycle back to Bissoe. 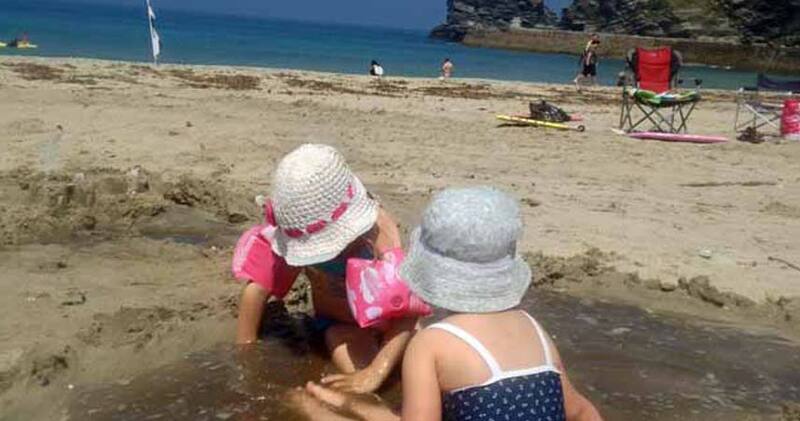 Portreath lies within the Cornwall Area of Outstanding Natural Beauty (AONB). At the height of the Cornish mining industry, it was a busy port, which imported coal and exported copper ore from the mines. These days, you’re unlikely to see more than a handful of fishing boats in the harbour. Portreath has a sandy beach with a stream running down to the sea. It’s a favourite with families, and it’s also popular with bodyboarders and surfers, as it has consistently good surf. There are public toilets close to the beach, as well as several shops and cafes. There’s a seasonal dog ban on the beach (Easter – 1 October). You could also cycle this route starting at Portreath if you prefer (bike hire is available from the Elm Farm Cycle Centre, just outside Portreath). The Coast to Coast trail also links up with several of the other Mineral Tramways Cycle Trails, so there’s always the option to add an extra loop and make this route longer. Getting to Bissoe and the start of the trail takes just over half an hour from Bosinver (postcode for Sat Navs TR4 8QZ). Follow A390 to Truro and then A39 towards Falmouth. Look out for the signs to Bissoe on your right after you pass through Carnon Downs. It’s worth taking the time to stop at the café at Bissoe, even if you have your own bikes. There’s a good range of refreshments, including hearty all-day breakfasts and ice cream. It’s also full of cycling memorabilia, including pictures, artefacts and signed jerseys by famous Tour de France riders, the British Olympic Cycle Team and other cycling legends. Parking at Bissoe is free if you hire bikes, otherwise it’s £3 for the day (pay in the café when you arrive). Have you ever tried a trailer like a Wee-ho? What did you think? We’d love to hear your thoughts on what makes a top family cycling day.